Noise is a major characteristic of cities especially in the developing world. Nigeria is not an exception. Major cities like Lagos, Kano, Port Harcourt, Aba and Onitsha have played important roles in the development of Nigeria’s economy and generated a lot of noise in the process. People get exposed to potentially harmful noise in two key places – homes and workplaces. Homes that are not well planned for often expose occupants to road, locomotive and aircraft noise. Workplaces such as commercial areas, factories, plants, mills and workshops generate high levels of noise from the heavy machinery they use. In Nigerian cities however, noise at both homes and workplaces is generated mainly from power generators (Gensets) which are very common due to poor power supply across the country. These generators, usually placed at a close range from homes and workplaces to protect them from theft and for ease of access, continue to destroy the serenity of the home environment with noise and vibrations. Another major source of noise within our cities is road traffic due to poor planning. Usually, our town planning attempts to solve the problem of noise pollution but because of poor projections of population growth, we often end up failing. Areas that were initially reserved for residential purposes, parks and recreation are often compromised for business, industrial purposes or religious houses and centers illegally. Unwarranted horn-blowing and faulty vehicles that are unworthy of being on the road further worsen the generation of road traffic noise. 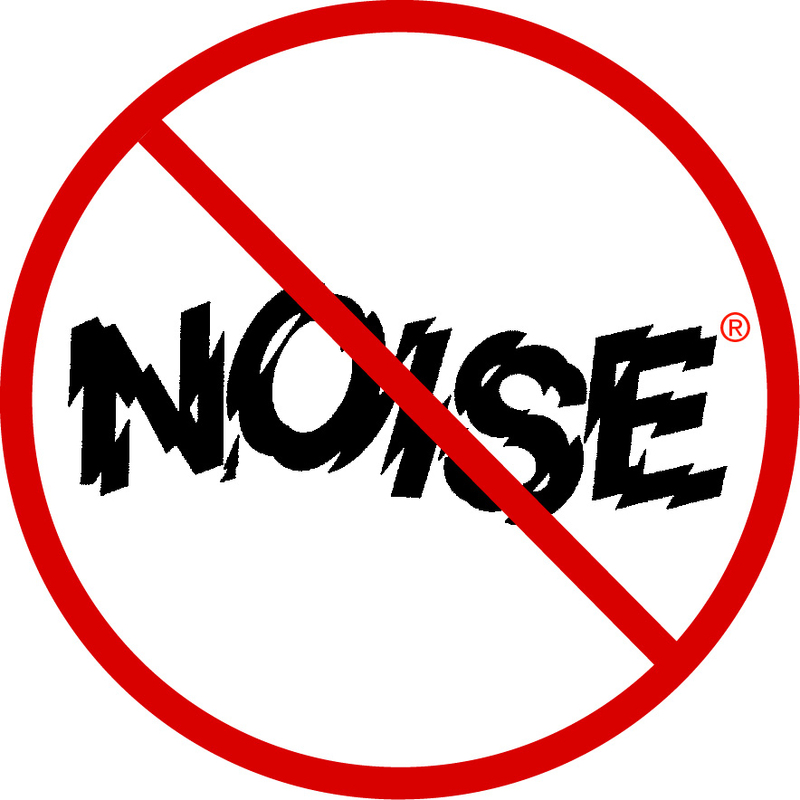 Such practices have made the task of noise control even more hectic than necessary. Short-term noise pollution from events and parties contribute to noise pollution in our cities. 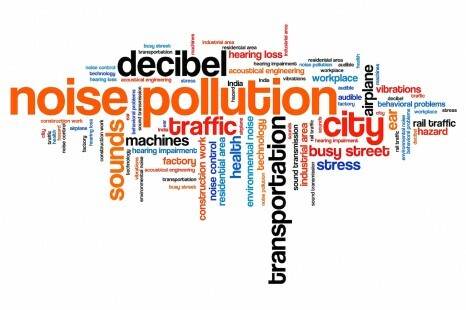 In most neighborhoods inhabited by low and middle-class members of society, noise pollution is severe because of lack of awareness and poor implementation of noise regulations. In fact, it has become the norm in some areas such that reporting an instance of noise pollution is considered strange and would not be taken seriously by authorities. The human ear is designed to regulate sounds between 0 – 160 decibels. While that range accommodates most artificial sounds, the healthy level of sound for the human ear is below 80 decibels (dB). Sounds that exceed the upper boundary of the healthy range begin to create health challenges in people and animals. There are various negative effects of noise on the human being. The World Health Organization (WHO) through a partnership with the European commission conducted a study which revealed that loss of hearing, cognitive impairment, hypertension, myocardial infarction, sleep disturbance; tinnitus -leading to psychological distress, depression, communication problems -and annoyance are some of the health problems caused by environmental noise. The harm caused by noise depends on the level and duration of exposure. The higher the noise level, the faster it causes harm; for instance, hearing a gunshot, siren or an explosion at close range could cause instant loss of hearing or tinnitus. On the other hand, exposure to noise from heavy road, locomotive or aircraft traffic for several hours per day could cause cognitive impairment in children, sleep disturbances and even depression in certain cases. Nigerian cities should not be allowed to grow without adequate noise control and for existing infrastructure, regular noise audits need to be conducted to ensure that healthy noise levels are maintained. National Environmental Standards and Regulations Enforcement Agency (NESREA) -The governmental agency responsible for the development and enforcement of environmental regulations- had developed the National Environmental Noise Standards and Control Regulations in 2009 and is working towards achieving its mandate. The efforts of the agency need to be supplemented through standard indigenous sustainable solutions. Noise is effectively controlled by manipulating its transmission and reception. In order to minimize noise pollution, noise has to be lowered either at the source or the receiving end depending on the nature of the source. Source-oriented noise reduction for road traffic noise includes the use of low noise emitting vehicles and fitting cars with efficient silencers. Noise barriers made from concrete, steel, plastic, wood minimize road traffic noise at the receivers end. While these materials help to reduce noise levels significantly, there’s a need to develop more sustainable solutions for environmental noise reduction that leave even lower carbon footprints. Solutions forged from the use of locally sourced materials such as fibers, wood and recycled plastic would not only lower costs of implementation but also stimulate local innovation and improve economy. Research conducted in Singapore recently explored the use of vegetation for road traffic noise reduction in urban cities. The research observed a noise reduction of 50% where a minimal to moderate planting intensity with a depth of five meters (5m) of vegetation barrier was implemented. This solution is a very effective one as it does not only reduce road traffic noise but also fights desertification, erosion of roads and lowers air pollution. The key to mitigating noise pollution in Nigeria is in the realization that the responsibility for keeping a healthy environment does not belong to the government alone. Citizens across all fields and disciplines need to involve themselves in this universal task. Doing so would create a consciousness that would enable urban planners to plan more functional cities, architects and engineers to develop noise reducing homes and workplaces, construct roads with sustainable materials that ensure noise reduction and government officials to enforce noise regulations. It would also enhance effective planning in transportation, building and construction activities to provide for minimal public disturbance. Effective noise regulation in Nigeria cannot be achieved by NESREA without the support of other relevant agencies. Ministries and departments of power, works, housing, aviation and transportation must cooperate and collaborate with NESREA to enforce and develop solutions to noise related issues. Whenever we think of speeding, the first thing that usually comes to our mind is traffic accident. This is not surprising because the Federal Road Safety Commission (FRSC) once reported speeding as the contributing factor to 50% of road accidents in Nigeria. The country is ranked as the second in the world in terms of road accidents with thousands of lives lost every year. Meanwhile, according to a 2015 data reported by the World Health Organization (WHO), road injury is one of the top 10 causes of deaths in the world. Now let’s broaden our perspective by looking at some additional dangers of speeding that have environmental significance. Before delving into that, it is important to understand what the speeding is. In road traffic, the term refers to the state of a motorist driving at a rate exceeding the legal speed limit. For example, a driver traveling at 60 kilometers per hour along a section of road with a speed limit of 50, is considered to be speeding. It is simply the act of over-speeding, a term that is commonly used as in Nigerian English. Generally speaking, the basic reason why speed limits are set is to ensure the safety of all road users. These include the driver, other motorists, pedestrians as well as animals that may share the roads with us. The speed limit set at a road segment is mostly a reasonable prediction of the maximum velocity at which drivers can control their vehicle after sighting an object. Even if an accident would occur in that state, the damage will be minimal. However, our love for speed betrays this important safety idea of traffic planning. Many human lives are lost to road accidents, but the number of animals that are killed on the road is even more startling. Death of animals on the road is a serious global issue with some species being endangered as a result. As reported by the BBC, a 2015 study by the Brazilian Center for Studies on Road Ecology gives the number of animals killed by motorists in Brazil to be around 1.3 million a day. Within same time frame, another 1 million animals get hit by motor vehicles in the United States, a serious issue that threatens the extinction of animals such as Woodland caribou and Florida panthers, according to conservationists. Has there been similar surveillance in every country, the figures would have definitely left us speechless. Even though the main culprit in these large-scale roadkill is the intrusion of highways (which are mostly freeways with high speed limits) into the habitats of the poor animals, the impact could still be minimized if motorists drive slower and more cautious than they do. It is worrisome how some motorists drive very fast even on local roads where crossing animals are expected. Recently, national parks in the UK complained about the rise in the number of animals being killed by speeding vehicles, despite the maximum speed limits being low. In Northern Nigeria, where livestock are let out to fend for themselves, many get killed in similar instances. Let us be considerate and think about these creatures before racing our vehicles on the road. Another way speeding impacts our environment is through increased fuel consumption translating to more carbon dioxide (CO2) emission. This may come as surprise because, logically, the difference between travel times associated with low and high speeds shall balance the fuel consumption. However, the fact is that fuel consumption increases disproportionately with increase in vehicle speed. According to the UK Department of Transport, a car traveling at 80 mph (129 km/h) consumes 10% more fuel than a car traveling 70 mph (113 km/h) for same travel distance. In its 2007 report on climate change mitigation, Intergovernmental Panel on Climate Change (IPCC), highlighted that due to the important role played by aerodynamic forces at higher speeds, reduction of vehicles speed on highways can significantly save fuel. They cited a couple of studies that proved the assertion. One investigation on certain old car models (1980s and 1990s) revealed a 17% more fuel loss at 70 mph compared to 55 mph. Similar study on more recent models showed an increase of 27% when speed is increased from 50 mph to 70 mph. Even without emissions in mind, the reduction in fuel consumption would be an appreciable saving to one’s budget. It is important to mention that the fuel consumption variation is two-tailed, because very low speeds have similar influence as very high speeds. For majority of cars, the fuel-efficient speed range is estimated to be between 50 km/h to 80 km/h. In addition to setting limits, various other measures are often employed to control speeding. One such measure that is common on Nigerian roads, including highways, is the speed bump or speed breaker. Although they are effective, having too many of them may be unfriendly to the environment. Most drivers will tell you that cars burn more fuel during deceleration and acceleration, and that is what happens when passing a speed bump. One experiment found that fuel consumption can increase by up to 60% by introduction of 4 speed bumps in about 1 kilometer. Priority should therefore be given to speed limits enforcement and educating road users on its importance. Other speed-associated issues of environmental concern are noise and vibration. World Health Organization cites noise as one of the leading environmental nuisance affecting people’s health, and it mainly comes from traffic. People who live next to a busy road know how annoying traffic noise is, and the disturbance is higher from speeding vehicles. Thus, traffic noise is directly proportional to vehicular speed. In fact, noise control is among the factors used in determining speed limits by traffic planners. Similarly, fast moving vehicles create high vibration that can have negative effects on their users and the surrounding environmental, including the road pavement. The thrill of driving at high speed and the unnecessary rush we always seem to be in shall not govern our choice of abiding by or violating speed limits. Let us always put into consideration the impact our speeding has on other people, animals, and the environment. As the saying goes, it is better to be late than be dead on time. Be gentle to the pedal because that serves the wellbeing of everyone, including yourself. A lot goes on in many corners of Nigeria, environment wise. Many people are unaware of the consequence of their actions on the environment. Two of the most common environmental atrocities being indulged in are cutting down trees and bush burning. Trees in bushes are cut down mercilessly to make ends meet. From a little beginning of cutting down one tree, so many end up being slashed down, like a weeding exercise. Indiscriminate disposal of waste is one. We throw plastics everywhere, aiding to the degradation of arable farmland. Agriculture is Nigeria’s highest employer and contributes about 25% to the GDP . Both cutting down trees and unsafe disposal of non-easily biodegradable wastes aids degradation of the vast arable farmland in Nigeria. Urban and rural areas, people of all ages and from all corners engage in indiscriminate disposal of different types of waste. Bush burning, against conventional widely known wisdom farmers use to prepare the land for the next growing reason unfortunately harms the top soil and environment. Research has consistently shown why it is a bad idea to burn bushes. Not only does it add to the air pollution, it kills other important vectors present on the farmland. A detailed analysis of the impact of bush burning has been written by our contributing writer here. A number of calls have been made to stop private companies and individuals who run car wash businesses by the road side. Soaped waters from washing cars that flow on the roads deteriorate asphaltic roads. This causes crack which eventually widen to become potholes. These actions are amongst the worst; they cause critical damage to existing infrastructure. The argument for environmental education shouldn’t be limited to the physical environment. Other actions cause negative effects on our human health. Many people use generators to power their homes. Most of these generators are placed closed to neighbours’ houses, often exposing them to unhealthy noise levels. High noises have been shown to increase stresses that cause headaches, hearing impairment, sleeping disturbance and depression. Many innocent people are at the mercy of those who use generators. In about 20 years from now, those people exposed to high generator noises are projected to experience hearing impairment. Air pollution is almost unchecked in many parts of Nigeria. Emissions from many cars are well above acceptable limit. People who frequent bus stops, unfortunately many Nigerians do daily, are always exposed to unhealthy breathing air. Port Harcourt in Southern Nigeria has been facing widespread air pollution from illegal oil refineries for months. The sad thing about this exposure is that effects are not seen almost immediately. Such infections deteriorates people’s health on a long period of time, but manifestation could take years. A common act done by many residents, private and government establishments is to burn their waste in the night. Thus people sleeping with open windows and passing by those locations face deteriorating health conditions in the future. Some even in the immediate present; asthmatic patients. On so many occasions, we hear sad stories of “there were trees here, but people have cleared them all.” According to Nature, 15.3 billion trees are cut down annually. The staggering figure leaves you wondering how much is remaining to continue to provide ecosystem services. A major reason why this is prevalent is because the perpetrators do not know the negative impacts of cutting trees down. While another first thought reason would be for income generation, the first point still stands. The ignorance of the effects of cutting down a tree, how it affects the livelihood of those in the society, the health and safety of everyone is prevalent amongst many. An equal knowledge of how a tree contributes to our wellbeing is absent in the minds of many. The aftermath of our negligence to environmental atrocities have impacted and will continue to impact our well-being, hence putting a worrisome cloud to what the younger and future generation would face in the future. Lake Chad has seen an unprecedented shrinkage in volume . It has resulted in exacerbating poor living conditions for the people living around it. There is less water to use for domestic, commercial and agricultural purposes, fishing activities have declined. The general decrease in economic activity in the region cannot be said to not add to the conflicts around the region. The Federal Government, NGOs, CSOs etc. are continuously advocating for afforestation programmes with the grandest of the projects to be the Great Green Wall. A wall to be composed of trees to be planted across 11 frontline states in Nigeria. This should continue by all means. Proper environmental legislations controlling noise levels from traffic, generators, event centres, use of honks in residential areas, etc. should be in place. Lagos State has implemented similar laws (pdf) for noise pollution. A good point to note is that many environmental atrocities are caused by rural people. Environmental legislations and protection in many cities focuses only on urban areas and on waste management. Initiatives discouraging deforestation in rural areas are seldom heard of, all the times. Environmental activism should focus a lot on those rural areas with so much emphasis made on the way and manner environmental education is passed to them. Local translations of the impacts of climate change should be articulated in the most comprehendible manner possible for the population. This ignorance necessitates that environmental education shouldn’t be only classroom knowledge limited to PowerPoint presentations. It should be taken outside the school environments in to town squares, village circles, markets, under trees, by river sides, at emirs’ and chiefs’ palaces and wherever a congregation of people gather in hamlets, villages, towns and cities. As much as sensitization on sensitive issues like maternal care, FGM, HIV/AIDS, girl child education and other topics are being promoted in many circles, rooms, halls, schools, rural and urban areas, environmental education should equally be promoted. What are your resolutions for 2017? For me, the previous year was one I dropped many practices that affect the natural functionality of the ecosystem and joined a campaign to raise the pitch on how only sustainable practices can guarantee our collective future and how so many practices we called ‘normal’ before are harming the environment. This year, I have pledged to do much more than I did in 2016. On the first day of this year, 2017, my very wonderful friend called to ask what my resolutions are for the New Year. After some deliberations, she complained how her social media timeline is flowing with ‘New Year, New Me’ display pictures and messages from her followers “as if they won’t revert to their old selves after January”. As usual, I laughed and sought her to remain environmentally conscious. This inspired me to write on some of our practices that are not so friendly to the environment. In one of my previous posts last year, I wrote quite an extensive article on water over abstraction (uncontrolled digging up boreholes). Many communities in Nigeria grapple with water scarcity as the government does not live up to its responsibility of providing potable pipe borne water. In some uptown societies, available water is either government provided through water board agency or from secondary sources and in abundance. Consequently, you find that many residents in such societies not properly managing this life giving resource. As far as the former is concerned, this is unforgivable! Water mismanagement doesn’t just end there; it has effects on the natural functionality of the environment. It causes drought, erosion and even flood. Power overconsumption has both economic and environmental impacts. When you waste electricity, you have scored an incredible own goal. 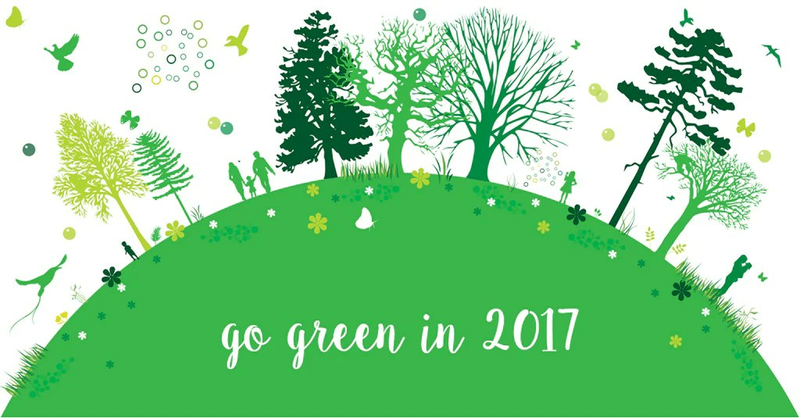 In 2017, pledge to use power resourcefully to save money and the environment. I called my friend, Bello, to inquire if there was light in his house so I can rush to do some work and his reply was “yes, light dey here dey waste” (meaning we have it in abundance here). Many at times we overconsume electricity without us knowing. We leave the light bulbs on, switches on, appliances running even when not in need. From unsustainable sources of obtaining water and fuels, dealing with the steam waste they generate, the monumental pollution involved and harm to aquatic and natural wildlife, power generation itself is harmful to the environment. My friend and Green Habitat Initiative co-founder, Sadiq Gulma wrote a wonderful piece on power usage here. This is one we all are guilty of at varying degrees. From throwing things away indiscriminately, loud use of music and PA system (especially our religious institutions), burning fuels through many, many media. We all are guilty of pollution. Our actions that have aided in polluting our ecosystem are so vast that it is itself a topic to write about. Sada Haruna wrote about how the indiscriminate throwing away of wastes block the drainages and cause flooding in many cities. For different reasons humans fell trees to either produce finished products (paper products, timber, firewood etc. ), to provide food (agriculture) or for developmental purposes due to ever increasing population growth and urban sprawl (Find my piece on urbanization here). Trees maintain some balance in the ecosystem where they provide us with cleaner air, serve as wind breaks and home for diverse species. Cutting them down indiscriminately without planting replacement for any reason whatsoever is an abuse to the environment. One major own goal mankind scores consistently. The outbreaks of pests and diseases and disease causing pathogens have been associated also with dirty and unkempt environments. There were those years where environmental sanitation was compulsory and enforceable. Not many states in Nigeria still observe this practice. With effective sanitation, our communities are cleaner, fresher, saver and much healthier and eliminate breeding places for disease causing organisms. Doing your part in cleaning your environment is very good, but there is need to call upon every member of the society to do theirs as well. 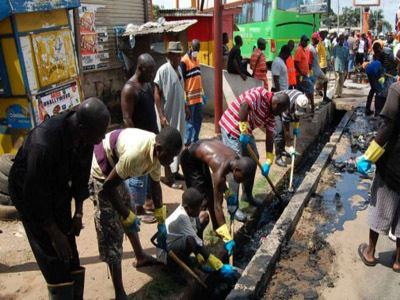 We call on the government at all levels to re-enforce environmental sanitation. When we go shopping, we collect so much plastic and end up dumping them in the trash bins. Likewise, we prefer to buy plastic water and soft drinks than bottled ones. These plastics which are usually recyclables end up being thrown in the environment which takes so over 50 years to decompose. plastic bottles take as much as 200 years to completely decompose. Another source of plastic disposal of environmental concern is the sachet water bags otherwise called ‘pure water’. GHI co-founder Sada Haruna wrote a piece on this. It can be found here. The past years have been dubbed some of the hottest years in recorded history and have been associated with man’s interaction with the environment. To save the environment and guarantee a better future for generations yet unborn, the responsibility rests on our shoulders. This year, I have renewed my pledge to drop all practices that rather harm the environment and alter its natural functionality and only adopt those that will reduce the rate of global warming. I want you to join me in this quest. Together we can achieve better results. Cheers to a sustainable 2017! Godspeed as we strive to achieve this. Since the Nigerian civil war of 1967, Nigeria’s ecosystem is only suffering the next big anthropogenic attack at two main fronts; southern oil spill caused by pipeline vandalism and oil bunkering and the northern bomb blasts and gun violence caused by Boko Haram insurgency. Naturally, efforts are directed towards securing the affected areas from the aggressors and insurgents to protect lives and property. The means by which these efforts are put are peaceful in the rarest ideal cases whereas in reality, such conflict resolution processes include military intervention resulting in the use of military equipment in combat and warfare. Whenever humans have encountered such times of terror, the immediate hope is for restoration of peace by bringing an end to all the gun shootings, bomb blasts and explosions. It is often after peace is restored that developmental strategies begin to come back to life. 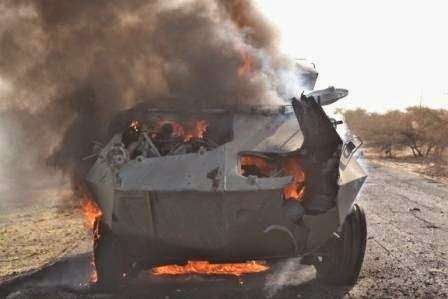 Such is the case of Nigeria’s current struggles in the Niger Delta and the North Eastern regions. During such times of serious unrest, bringing up environmental consciousness is considered a digression from the main issue at hand. The fact however remains that whatever the outcome of such unrest, whether resolved or not, the environment is always negatively affected and that is only seen when restoration plans are put on the table. In times of war and conflict resolutions, weapons used are manufactured to effect maximum damage to human lives and property. Such weapons are composed of toxic substances such as heavy metals in bullets and explosives and poisonous hydrocarbons from fuels and landmines. Explosions and gunfire are major causes of forest fires during war creating serious pollution of air, water and arable soil. The impact of pollution caused by wars is not short lived. In the most globally unforgettable outcome of the Second World War, the victims of the Japanese Hiroshima and Nagasaki atomic bomb blasts continued to suffer serious health problems like leukemia for decades due to exposure to harmful radiation from their surroundings. In wars free from atomic bombs, plastic and metallic shells from bombs and explosive devices find ways to remain in the environment having been washed away to water-bodies or buried underneath the topsoil. Particulate matter (dust and ash produced as a consequence of burning) and gases emitted end up mixing with atmospheric gases to contaminate the air thereby resulting in respiratory diseases such as asthma, emphysema and lung cancer in humans or constitute acidic precipitation which is toxic to plants, terrestrial animals and aquatic species in fresh and salt waters. The soil, unlike water or solar energy, is a non-renewable natural resource which must be well maintained through sustainable exploitation. Insurgency in the North has exposed arable soils around local communities and within forests to pressure from chemical pollution causing nutrient imbalance and loss of soil organic matter, movement of heavy equipment causing compaction and loss of soil texture and interrupted environmentally friendly developmental projects such as afforestation and desert reclamation. Consequently, farming activities which serve as a major source of income generation in the North has become threatened affecting the lives of the local dwellers. The degree of contamination however is not uniform across all affected areas as some are more severe than others. While some farms may still be cultivable, there are still risks of harvesting poisoned yields from such lands due to infiltrated toxic chemicals if they are not properly reclaimed and decontaminated. 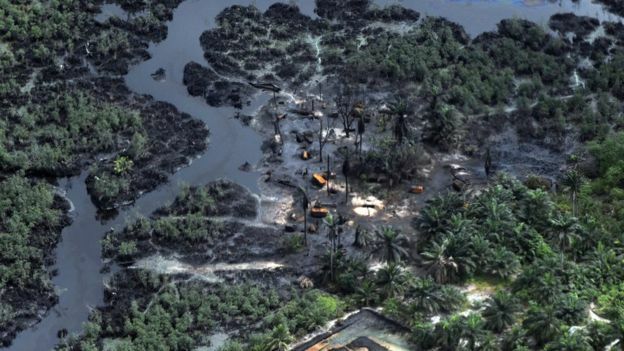 Oil Spills in Nigeria’s Niger Delta region have contributed immensely to the intoxication and degradation of aquatic subsystems and arable lands in southern Nigeria. An area once known for its active fishing and specialized farming practice can hardly support algae and other aquatic micro-organisms. This is often discussed as part of the genesis of the unrest in oil rich southern Nigeria. The nature of Nigeria’s current anthropogenic attack is different from common occurrences due to the terrorist element, duration and the victims of the attack. Therefore, the nature of the environmental recovery and reclamation must fundamentally cater for the immediate needs of host communities in form of sustainable relief and intervention schemes. These should be used as avenues for the introduction and promotion of more eco-friendly alternatives to conventional resources such as solar-powered electricity and water systems, recycling and reuse of recyclables and efficient usage of resources. Reclamation should commence at the most vulnerable parts such as surface waters and community wells as well as adopt biological remediation techniques using plants and micro-organisms at the cleanup phases. By-products of the cleanup should be recycled or properly disposed. The practice of conducting environmental impact assessments before projects are initialized is commonplace in the promotion of environmental consciousness in our developmental processes. This time, the remediation should be enriched with revival of native terrestrial and aquatic species to better preserve socio-economic and cultural essence of the region. The responsibility for maintaining a functional biodiversity is a collective one that should be spearheaded by the government as key stakeholder in preserving the nation’s natural resources. An environmentally conscious government would train security forces by integrating environmental awareness into training programs for improved environmental protection and management. Simultaneously, private companies, commercial bodies, unions and civil organizations as well as individuals must assist in enhancing this strategic mission because the value of a healthy environment can never be overemphasized. Adamu Abdullahi is a contributor at Green Habitat Initiative. A master’s degree holder in Environmental Engineering from Warsaw University of Technology in Poland. He is interested in renewable energy, environmental solutions and innovative technologies for sustainable development. Like in many other West African countries, sachet water is one of the major sources of drinking water for a large part of the Nigerian population. Commonly called “pure water”, it is a supposedly treated water sold in polythene sachets consumed by members of every social class. While the National Agency for Food and Drug Administration and Control (NAFDAC) ensures that every sachet water producer complies with health and hygiene regulations, the fate of plastic waste generated by the industry has never been in check. With the absence of proper waste disposal and recycle systems in our cities, “pure water” sachets are becoming a nuisance to the environment. A documentary is not required to highlight how rampant water sachets are in our surroundings, one just need to look around to see them everywhere. Except for a few environmentally conscious citizens, everyone who buys a sachet of water on the street throws it away in the open space after finishing it off, not minding where it will end up. The main reason behind our addiction to sachet water is the absence of a more affordable alternative. In countries with efficient infrastructure, people rely on public water supply for drinking and other domestic use. In Nigeria, most cities do not enjoy that and citizens have to devise their own means of obtaining water. In places where it is available, tap water in Nigeria is not trusted to be safe for drinking. Hence, it either has to be treated or resort to buying from the shops. “Pure water” is the preferred choice for many because of its affordability. Even when there is large quantity of drinking water at home, Nigerians do not usually go around with some in their possession. Before I went to Kenya, I always think reusable water bottles are only meant for athletes and hikers. Most cities there have reliable water supply and people conveniently drink from it because it is safe. While outside, they keep a bottle with them which they refill as often as necessary. Because I still had my Nigerian attitude, I did not take the words of my friends on the safety of the tap water but kept spending my money to buy bottled water. Nevertheless, I eventually managed to change and I now have a water bottle always in my possession. One major environmental challenge associated with polythene bags and other plastic materials is their slow biodegradability. The time it takes plastic bags to decompose completely is estimated to be between 10 to 20 years depending on the exposure level. This is as a result of a complex chemical links between the molecules in the material which is difficult for bacteria to break. Although there have been significant achievements in the development of degradable plastic bags in recent years, most of what is being used remain the non-biodegradable ones. How is the presence of non-biodegradable plastic materials in the environment a problem? First and foremost, the presence of plastic waste in an agricultural land impedes the growth of crops. Even though they are thin, plastic bags stop crops’ roots from moving around to obtain nutrients from the soil. Moreover, it does not decompose to become part of the nutrients and at the same time inhibits the biodegradable materials around it from doing. Farmers whose lands were infested by plastic materials can attest to this challenge. Another problem associated with plastic bags in the environment is their impact on public health and sanitation. As mentioned earlier, it is a big concern in many areas how plastic litters cause drain blockage which results in water stagnation. Even when they do not end up in drainages, plastic bags store water by themselves. This becomes a breeding nest for certain disease vectors especially mosquitoes. Whenever such monster bugs are bugging you, remember that the water sachets you have been throwing away in the open space may have a role in it. The harm is not limited to us but also affects other living creatures around us. Just the way children innocently eat objects assuming them to be food, several animals find themselves having a lunch or dinner with plastic bags. This report highlights how cows in India ingest plastic materials while scavenging in the open garbage bins. Since it cannot be digested, the plastic accumulates in their rumen which eventually leads to their death. There have also been many reports, such as this, on aquatic animals such as seabirds and whales dying from ingestion of plastic. Large number of plastic bags we dispose are transported by water and wind into lakes and seas. The environmental cost of plastic waste is undoubtedly enormous. Provision of potable water that is safe for drinking to all Nigerian will go a long to solving our sachet water demand and subsequently protects our environment from pollution. This is of course the responsibility of the government while the citizens do their part by paying tariffs and protecting installed infrastructure for their benefit. Nigeria needs to put more effort in that direction with the support of international organizations so that the sixth sustainable development goal set by the member countries of the United Nations can be attained sooner than later. Another step towards curbing the menace of plastic waste is incorporating sustainability in the regulations governing their usage. The non-degradable plastic is ubiquitous because of its relatively lower cost of production compared to degradable plastic. All stakeholders need to understand the environmental issues at stake and necessary tradeoffs in order to switch to sustainable materials. Since water sachets cannot be reused like plastic bottles, proper policies need to be put in place to their collection and recycling. For example, before a definitive reformation can be attained, a short-term approach of incentivizing plastic bags collection by citizens can be helpful. There are undoubtedly many problems bedeviling our environment and plastic the litter from water sachets is one of them. It is our collective responsibility to work together towards controlling this avoidable menace. Building developers who submit building development plans in Abuja are now advised by Development Control to incorporate green building concepts in their building plans. Developers are given a long list of green solutions to include, when they submit their initial building plan for approval. The Department of Development control of the Abuja Metropolitan Management Council is the first building development authority to start this green building initiative in Nigeria. Recently, Kaduna State Development Authority mandated four trees to be planted in for every 900 square metres certain footage area of a plot of land. Such green building concepts are what the construction industry needs to become more environment friendly. Abuja, the nation’s capital is a purposefully designed and built city with a master plan conceived in 1975, among the few in the world with such plans. Every development to be done must be carried out in accordance with what is in the master plan. There is no city in the country with strict building regulations and enforcement than in Abuja. Development Control is a government department in the FCT with a mandate to control all development (building) works in the FCT. All intended building developments must submit their architectural and engineering designs to the department who vets them in order to make sure they conform to safety and building regulations in Abuja. It was music to my ears when I interacted with the Secretary of the newly set up Green Building Committee in Development Control. The committee is recent he said and the building developers are asked to enforce green building regulations voluntarily. In about three to four years, they intend to make compliance to the regulations compulsory. The department generally advises developers to improve their designs in 6 major areas; sustainable site development, indoor air quality, water management, energy management, solid waste management, cost effectiveness and sustainability. Although capacity by local engineers and architects to do this might be wanting, it is a step in the direction as it will motivate them to search for new knowledge in this field. In the United States, the parent body of green building professionals is the United States Green Building Council. Every year, they congregate members in one city and provide them with numerous education sessions to improve their skillset and knowledge in the sector. Regional and state wise, many state and green building chapters organize frequent educative sessions. Responsible professional organizations like the Nigerian Society of Engineers and Nigerian Green Building Council need to step up effort in providing capacity development seminars, symposia and workshops for practitioners in the building industry. Education does not stop at professional associations, but also in universities. Numeorus universities across the world now offer tailored degree programmes and professional certifications with a focus on green buildings. Jomo Kenyatta University of Agriculture and Technology has a Green Building Group set up in collaboration with UN-HABITAT. Universities in Nigeria can capitalize on the opportunity in providing certificate programmes in this field. Green buildings are part of the solutions to many problems in the construction industry, many of which we are not aware. When putting up a green building, problems like construction waste, air and noise pollution are mitigated to an environment friendly tune. The green (resource-efficient) buildings conserve resources like energy and improve occupant health and productivity. In a personal blog I wrote here , I expatiated enough on the different aspects of a green building. It has been far too long that we, as building designers got lost in the technology world. A major percentage of the buildings in Nigeria are designed without particular attention to the local climate, specifically in terms of sun-path, wind direction, air temperature and other microclimate conditions. Considering these parameters will improve ventilation in the buildings and reduce energy consumption. Instead, buildings are designed with a sole reliance for technology solutions. We design buildings with small windows. Provision for ceiling fans are no more made with the POP made. The reliance for cooling is just on mechanical cooling, the power that isn’t sufficient. Nature is meant to be looked as a source of inspiration for our designs and solutions and not as a problem to our existence. In a tropical climate like ours, where the weather is mostly hot, we need heating, ventilating, and air conditioning equipment almost round the year no doubt. But a bioclimatic design will reduce the reliance on such equipment. Provisions should be made to take maximum advantage of the climate. Ventilation shouldn’t rely solely on mechanical cooling, natural ventilation and other heat mitigating measures can play a big part in reducing the times needed for mechanical cooling. As global calls to accelerate the shift to a more sustainable construction industry, the building regulators in Abuja have made a giant stride in institutionalizing a sustainable industry. The three to four year intended plan of obligating the regulations might not be soon, but the step is one in the right direction.